Hello! Today I have another Nicole Diary stamping plate to show you, along with another quick design. If you missed my first post (yellow sunflowers using plate ND106), you can see it here. 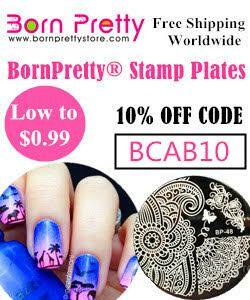 For this post I will be showing you plate ND110 which I used to create the design below. Read on for a closer look at the plate and more info! Before I get into my design, here's a look at the plate (ND110). As before, the plate measures 6 x 6cm and consists of 6 large patterns. Catching my eye this time were the wonky/skewed squares on the top left. 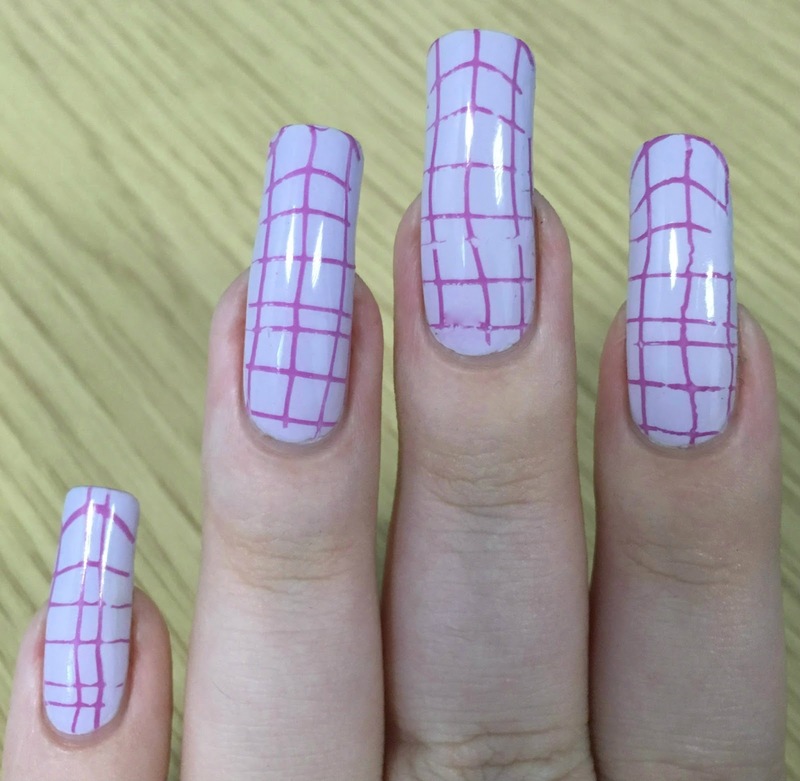 They remind me of a picnic blanket (or maybe a tartan shirt for autumn/winter!). 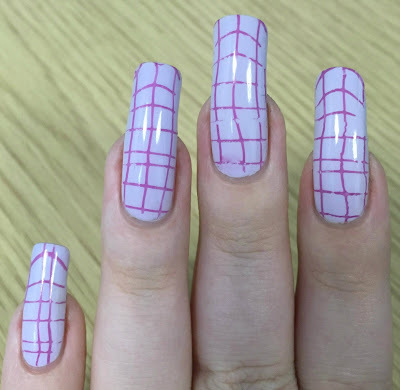 Following on from my picnic blanket idea, I thought I'd go for a pastel base with darker, more striking lines. I started with Models Own hypergel 'Lilac Sheen', a soft pale lilac (swatched here). Below is two coats and topcoat. 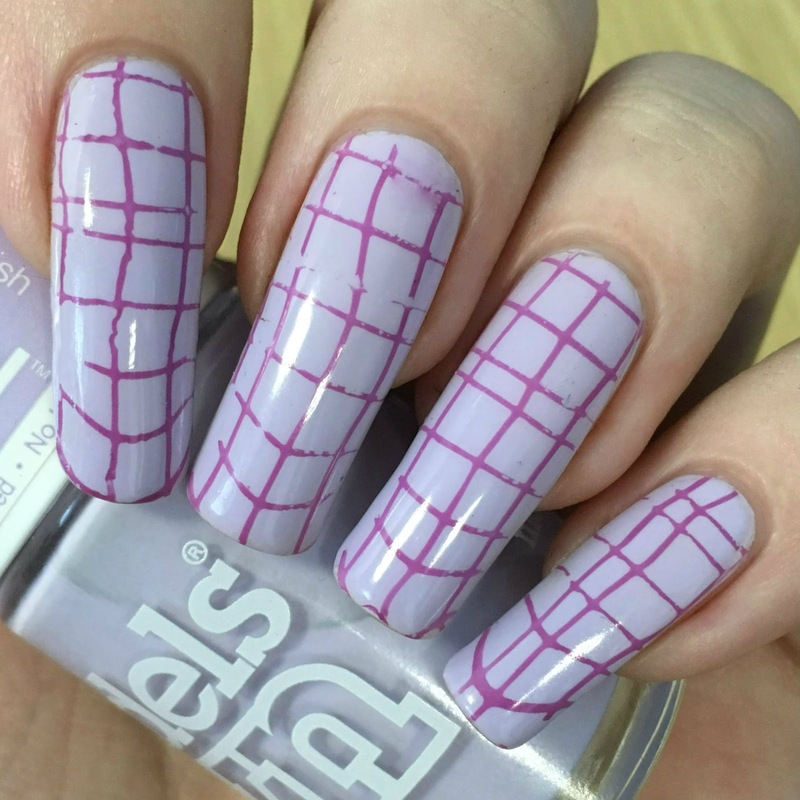 I stamped the square pattern onto each of my nails using MoYou London 'Orchid Chic' and my squishy rectangular stamper. I really like how the 'wobbliness' of the lines helps to hide any mistakes made - I didn't have to be quite as careful. I then left it to dry a few minutes before sealing everything in with topcoat. What do you think? I love them! Thankfully I think the colour combination worked really well, it feels very summery! Like last time, I found the plate really easy to use and had no problems picking up or transferring the pattern. I have one more Nicole Diary plate to show you, keep your eyes peeled! You can find Nicole Diary on Instagram here and Amazon here. A lot (if not all) items appear to be on sale, and all come with free shipping. Yes great color combo, love the purple and pink stamping polish. Love the color combo and I like the "wobbliness" of the pattern too! Good color combo. nice plate. Great mani! I really like the 'imperfect' pattern, its a nice change!